Summer has ended with a return to warm temperatures and a big sigh of relief. I love the last few weeks when you have fully sunk into sleeping in and reading lots of useless novels. Haha-that didn’t happen round here and August has kept me busy and happy. 1. After moving home from VT in early August, I packed my bags and went to a Nancy Crow workshop sponsored by the Muskegon Museum of Art. I had taken it before but signed up knowing that a little refresher is always good for you. The title of the class was Sets and Variables and the intention was to manipulate a “motif” you have made into various assignments. Peek to the left and you can see the beautiful workspace! The workshop was given in a recently renovated building in downtown Muskegon and I fell in love with the high ceilings and great lighting we had. I greatly missed Margaret’s cooking as we ate out for lunch/dinner which really disrupts your process. I struggled with staying focused for the exercises. I learned quite a bit about my working habits that are getting in my way. 2. Nancy Crow gave a lecture on Thursday night in conjunction with the opening of her solo show titled “Transformational Quilts“. It was a treat to here her speak about her work, her career and inspirations. The exhibit was breathtaking and included older work and some very new pieced work. ( No photos allowed. ) I have never had the opportunity to see more than one or two of her pieces in the past. She is definitely the master of color and composition and this exhibit reveals that so clearly. It took my breath away to see such a variety of styles of her work in one space. The two events were a treasure for me. If you are in the area, you definitely need to see this exhibit. If you aren’t in the area, think about making a visit there before it closes in mid- October. 3. 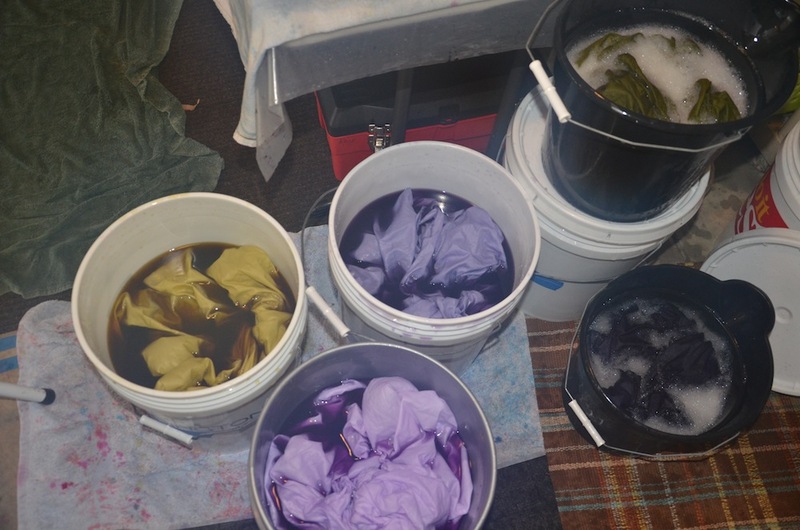 I went back to fabric dyeing last week. I am in love with full immersion of really dark pieces. 4. 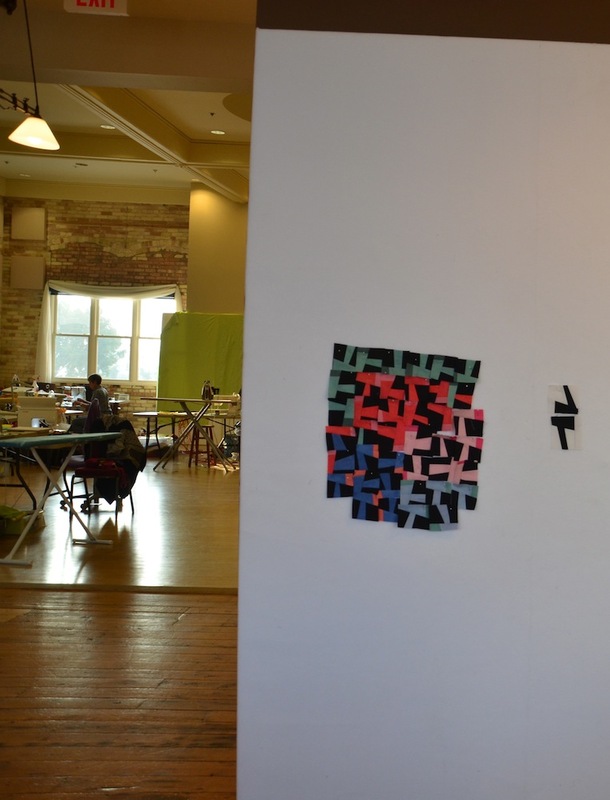 I assisted in the hanging of the AQS show here in Grand Rapids. It was amazing to see what goes on behind the scenes in a show. I signed up for a shift to help hang the quilts and enjoyed seeing both sides of the quilt. 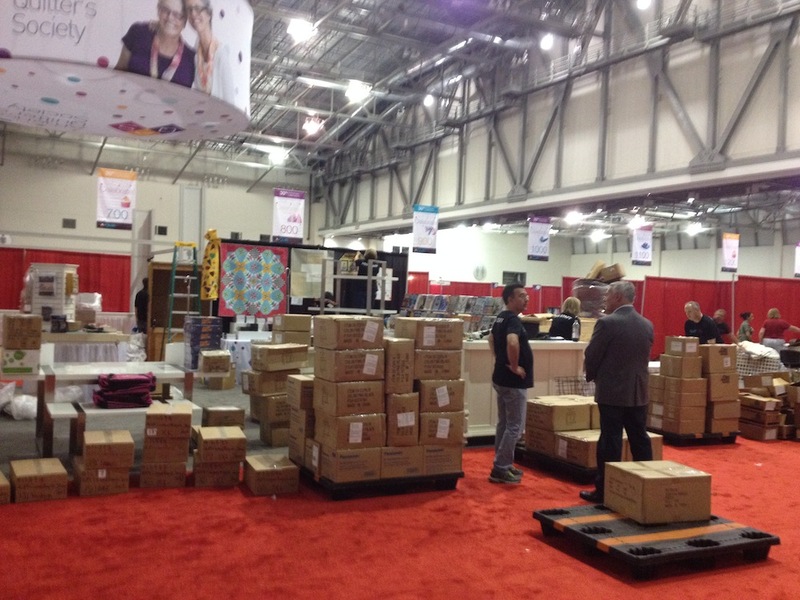 I also appreciate what the vendors do to get their merchandise ready for all those crazy buyers. And now my son is back in school and my daughter is at college so I am back to regular studio hours and the fabric is flying. I am on to the next season of work and play . What are you working on? 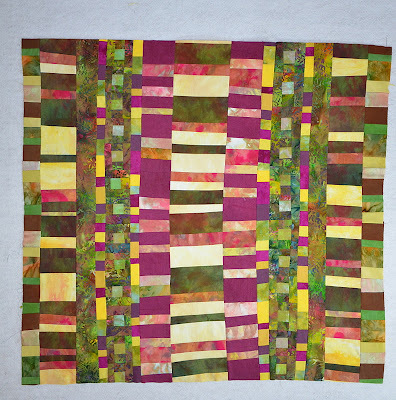 This entry was posted in AQS, improvisational quilting, motifs, nancy crow, Uncategorized on September 7, 2014 by Colleen Kole. It was truly a mirage, a delusion, an outright lie I told myself. I really, truly believed that by making this piece, I would have a new, empty drawer to fill up with 2014 scraps. It took me the entire week of my design/ piecing time that I had allotted for the week. ( A new goal for 2014 -divide studio time into design and finishing time). The quilt is pieced but I made little headway in my quest to use the scraps. The drawer remains really full but the top is pieced. And my irrational obsession of using up curvy strip sets has been temporarily taken care of. It turned out to be about 40 x 52 without the facings on it yet. I will baste it tomorrow and have it in line for machine quilting. I think I will back it with flannel , use on it my couch. and go back to my list of what I should be working on! More about what I have planned for 2014 in the next post. 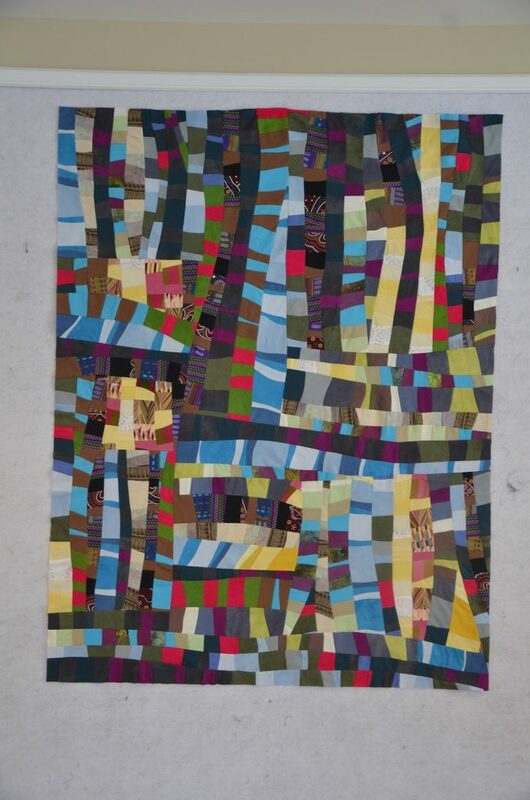 This entry was posted in improvisational quilting, Quilts 2014, Uncategorized on January 18, 2014 by Colleen Kole. I have to admit it started awhile ago. I opened one of the drawers next to my sewing machine and I found a whole boatload of curvy fabrics from a workshop. I know it was a Nancy Crow workshop but I am not sure which one. I quickly shut the drawer knowing I was deep in holiday mania making mode. But I didn’t forget it. In fact, that drawer became this little niggling thought in my head. What could I make with those strips? It needed to be cut up. What am I waiting for? No it doesn’t need to be cut up. It’s ugly. Yes it does. Don’t you see how much of it there is? Then began the era of procrastination purging. If I use it up, then I would have a whole empty drawer. Ok, Ok. Normal sane people would just dump the drawer in the trash and move on. Nope not me. It needs to be used. It can be beautiful . I know it can. Now, I am going on day 4 of trying to make something wonderful with some not so wonderful strips. It has become more of an obsession to make something wonderful . Up and down and cut and sew some more. It was four times as large as you see in this last photo. 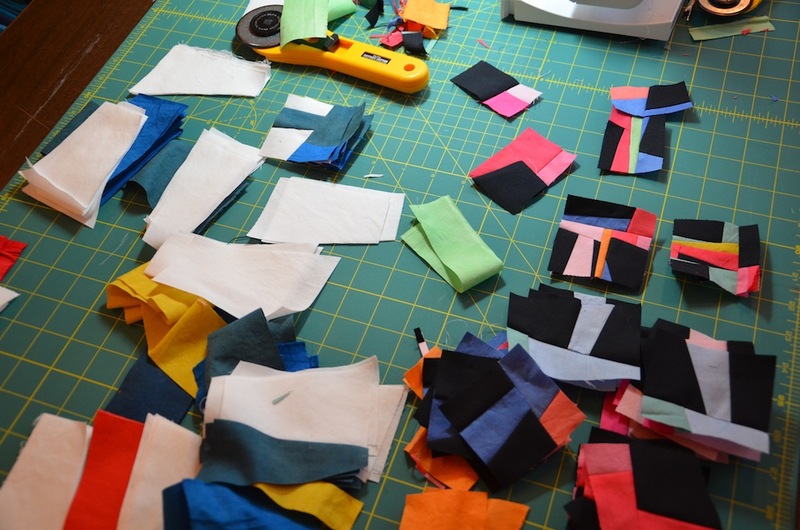 Crazy piecing with strips in colors that I would never choose to sew together today. And finally, tonight, I have given myself a deadline. If it isn’t sewn together by tomorrow night, it will not be done. Ever . The obsession has become very irrational which is why they call it an obsession. And there is good reason why I do much better with a set of goals at the beginning of the week and stick to it. Otherwise I waste time with ill thought out projects. Ugh. 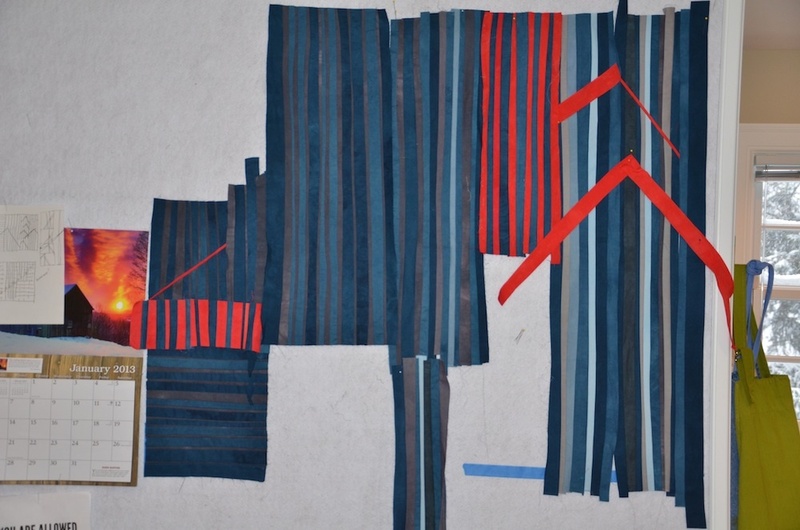 This entry was posted in focus, improvisational quilting, process, process of becoming an artist on January 15, 2014 by Colleen Kole. I thought I would be showing you a finished piece at the end of this week. It always takes longer than I think it will. When I went to put the binding on tonight, I realized that I had a huge spot of machine oil on my piece. I took a really deep breath . I didn’t hyperventilate but went back and read the directions on the wool batting I used. ( For the first time) No hot water and no agitation. Ok then. Mmm…. I shoved it in the washing machine with cold water setting and some synthrapol. I was worried that the fuschia would run like crazy. It didn’t. Blocked, fans on and waiting for it’s binding. These are the days that I think I may be a bit crazy for estimating could finish 20 total by December . But, I always love challenge. This entry was posted in improvisational quilting, machine quilting, process of becoming an artist, Quilts 2013 on April 26, 2013 by Colleen Kole. It was a slow moving process with this piece. 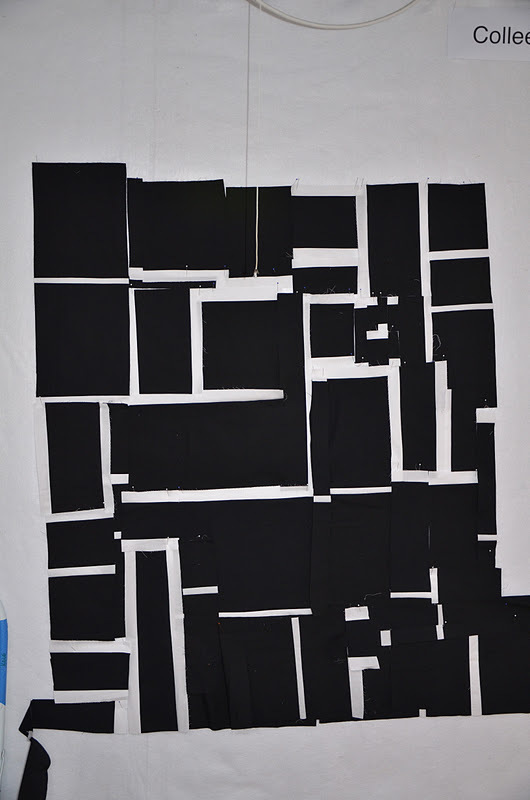 It began as a small little idea and a small portion of this design was pinned on my wall for many months. I kept taking it down and putting it back up again and it was assuming this grandiose design idea in my head. It was taking up too much space on my wall and in my head. SO, I gave myself two weeks in January to get it done as I was very sick of this great visionary piece. Haha. 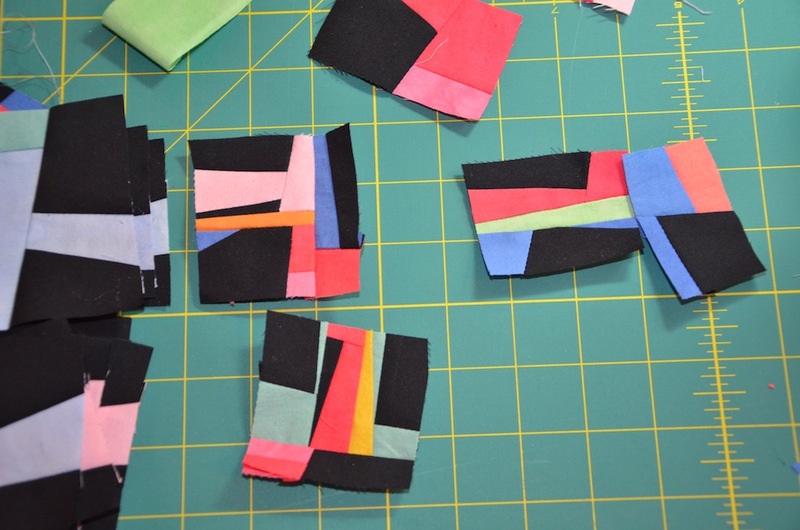 This was not your typical strip piecing. 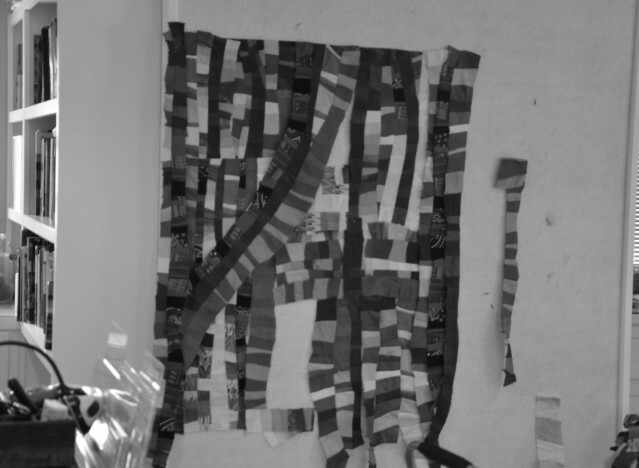 I cut each piece separately after I sewed each seam which became very time-consuming. But I really wanted to work on my line work. What a good word: finished. This piece didn’t turn out like I envisioned ( maybe over thought it too much ) but there is always the next piece. And no longer than two weeks per piece seems like a really good idea! 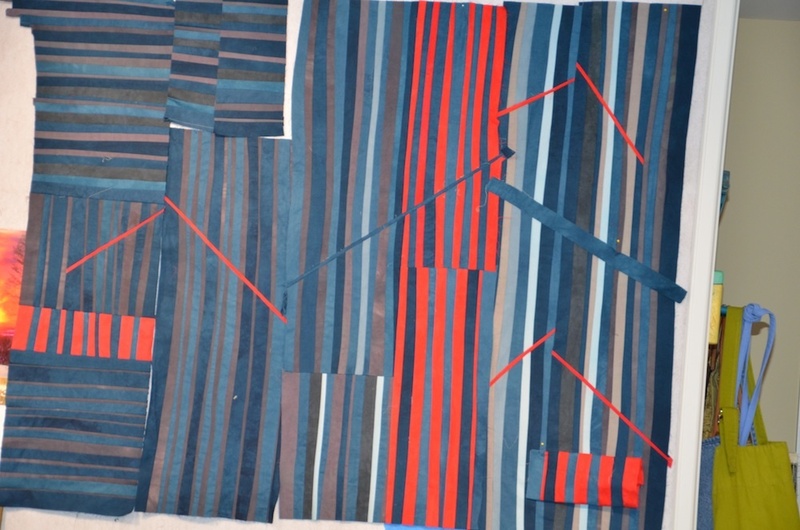 This entry was posted in free motion quilting, improvisational quilting, Quilts 2013, working in a series on February 18, 2013 by Colleen Kole. 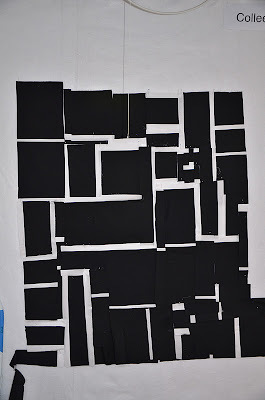 When I get to a certain point making these improvisational quilts, I ask myself the same question. Who is going to win: the quilt or I? Now, being a fairly determined person, I hate to lose. 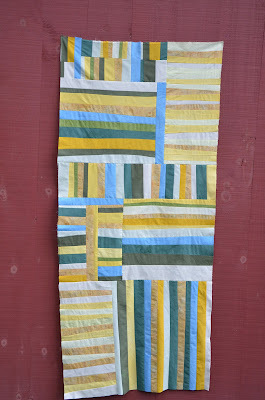 So, the story of this little quilt began when I purchased a group of fat quarters from another hand dyer, Sue Cortese. 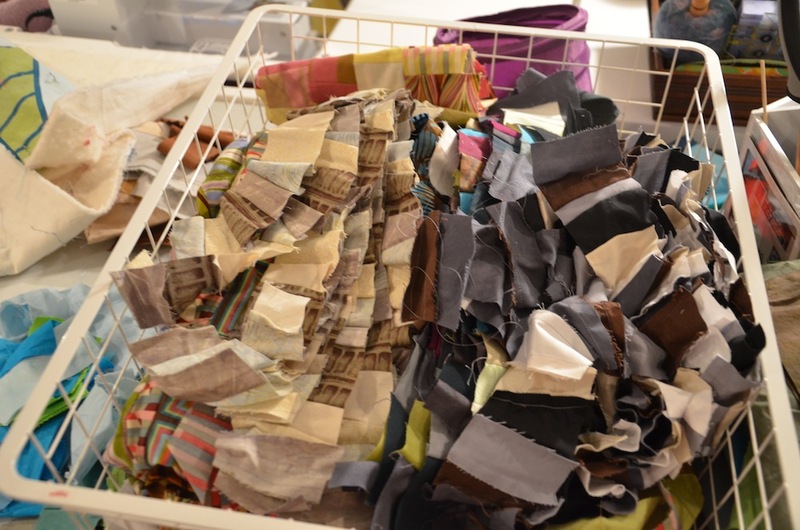 I usually dye solids so all these luscious little pieces of multicolored fabrics were calling to me. I even dragged them with me to the last class and occasionally petted them thinking of what could be made. They just said the colors of fall to me. 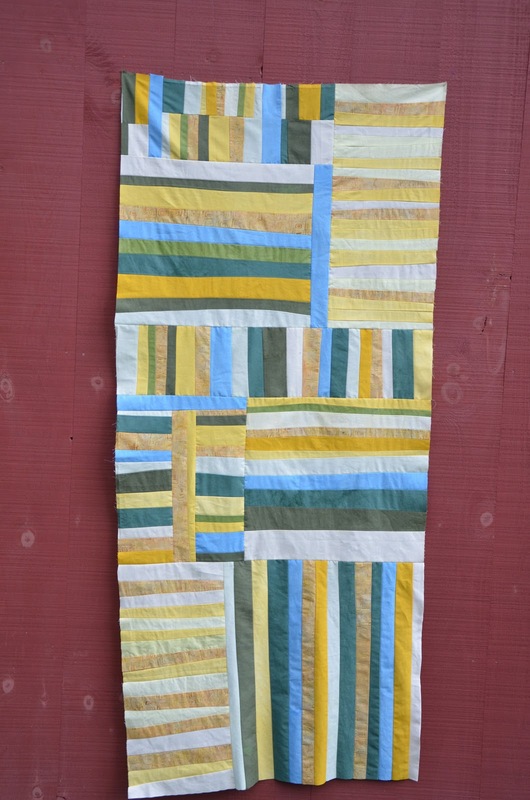 And I wanted to make a ribbon quilt so it seemed a perfect thing to make that would be quick. 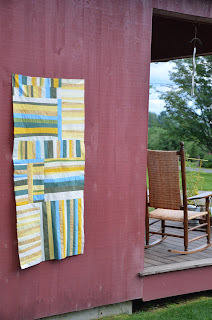 My first mistake was making a prediction that anything involving quilting would be quick. Twenty some years later you would think I know that making a quilt is anything but quick. A month ago I started this very simple piece. I also ignored the fact that some long strips were looking very skewed. Now, sometimes skewed is good. But obviously some are very straight and one are skewed. So, skewed here is not ok. It should have been randomly skewed. But after many re-sews and cuts, I have declared myself the winner and the quilt the winner as well. A tie. The quilt wants to be crooked in spot where I don’t want it to be. But I finally just let it be what it wanted to be. And I win because I actually finished piecing this thing and enjoy some of the fabrics. The top is done where a year ago I would have given up. Crooked but done. I will eventually quilt it. I just need a teensy break from it. So, I remind myself not to make predictions of how long it will take to complete a piece. If stuck, move on. And, sometimes, it’s ok to let the quilt win. Or tie. 🙂 I am more than ready to move on to the next thing. 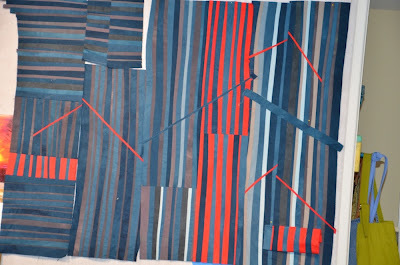 This entry was posted in improvisational quilting, process of becoming an artist, quilts 2011 on November 9, 2011 by Colleen Kole. I did. I just soaked up every minute of the Barn last week for the Improvisations class given by Nancy Crow. 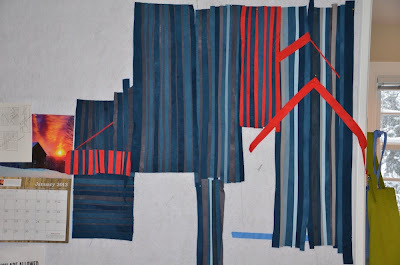 It was a tough class for me-quick paced and some of the art concepts were obviously things I hadn’t really thought of fully before I design a quilt. Or even knew. 1. I learn more at my one week workshops at the Barn than I ever did in a semester of college. Ask others and they will say the same. 2. It is absolutely wonderful to share time with others who have the same goals and interests. And laugh with them. Making art is lonely and a sharp contrast to what I did before with people every minute I was working. I didn’t realize how lonely I was! 3. Nancy, her family and Margaret Wolf work together and give above and beyond to make this a great learning experience. Nancy spent a considerable amount of time with us and for that I am truly grateful. 4. Yes, I did sew spending from 7:30 am -10pm there working away. Uninterrupted time except for meals. Wonderful meals. 5. Carol Soderlund was teaching a surface design class there at the same time. It was a treat to see what that class did and see Carol’s happy face. I think one of Carol’s classes will be next in line for me. 6. Set aside comparing yourself to others and what they are doing. You can’t be at any other place than where you are currently are at in your artmaking. I am grateful to have had this opportunity. If you have a chance to go to the Barn, don’t hesitate to go. The experience will exceed your expectations. And that expectation should be about learning as much as you can and not about producing the miracle piece. Be inspired, my friends- I am over the top inspired. And a little tired. This entry was posted in improvisational quilting, nancy crow, process of becoming an artist, workshops on October 10, 2011 by Colleen Kole. I was rattling around in a cupboard and I found a lovely blue enamel pot. I looked inside of it and not a speck of rust or chip inside of it. Perfect for bundles I thought to myself. I forgot I had bought it last year at a yard sale. So, I scrounged around in one of my boxes I am packing up to send home and there was a perfect piece of white fabric. I chop it up into about six pieces-and went on a hunt. “She is looking for things to wrap up in fabric. She is going to boil it and it will smell,”says one daughter. “For real?” says the other daughter. “Yes, for real,”says the mom.” It is called eco-dyeing. ” Lots of eye-rolling. I was really hoping for some brighter leaf imprints but, of course, couldn’t find the book I needed. I think I already sent that home. I really have trouble remembering where I leave things. And which light switches turn on which lights. No wonder they think I am crazy. But I ended up with some pretty yellow fabric which they thought was pretty as well but involved too much work. Buying it at a store was mentioned….but then it wouldn’t be mine, would it? I like the marks the coreopsis made-nice and gentle. I thought I was all done with dyeing but I guess it wasn’t done with me. This entry was posted in fabric dyeing, improvisational quilting on August 13, 2011 by Colleen Kole.